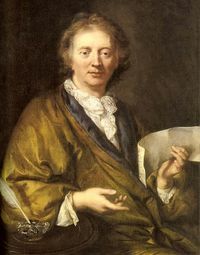 François Couperin (1668-1733), French composer organist and harpsichordist, is sometimes referred to as “Couperin le Grande” ('"the great") to distinguish him from a line of musical namesakes, both men and women, that flourished in France for about two centuries from the middle of the 17th. By his mid-twenties, Couperin was organist at the private chapel of Louis XIV. Three years later he would (like at least another eight of his family) become organist at St.Gervais in Paris. His fame rests with his many small compositions for harpsichord, nearly all of which are named and so form early examples of descriptive pieces – what would later become known as “programme music”. They would, for example, be impressions of nature, evocations of emotions, imitations of birdsong or animal sounds and the like, even social satire. He also wrote chamber music, songs, organ and sacred pieces; and a treatise on harpsichord playing - "L'art de touche le clavecin" - which is still a valuable resource on the subject. This page was last modified on 13 February 2017, at 15:32.